SIBU: The southern and northern regions of Sarawak, divided by the Rejang river, will be bridged by Oct 21  in time for the festive balik kampung rush. The good news is that the authorities will not impose any toll on the new 1.2km Durin bridge  which for years had been the missing link in the 1,000km Pan-Borneo Highway. 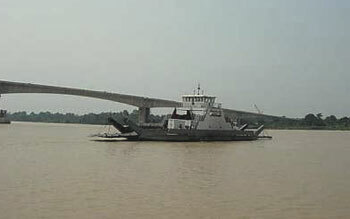 LAST DAYS: A ferry making its way across the Rejang river with its passengers. Once the new Durin bridge is opened on Oct 21, the ferry services will end. It is a toll-free bridge; motorists do not have to pay a single sen to use it, state Urban Development and Tourism minister Datuk Wong Soon Koh told reporters during an inspection of the project on Saturday. The bridge will be opened to traffic on Oct 21. It will also be the last day for the ferry services in Durin, which will cease operations on Oct 22. Thousands of motorists use the ferry crossing daily and during festive peak periods some had to wait for one to two hours to cross the river. The more than RM130mil bridge, funded by the Federal Government, took about a decade to complete after the earth-breaking was done in 1996. The delay was due to change of contractor and sub-contractors who faced financial difficulties. Brooke Dockyard and Engineering Works Corporation took over the project in 2003 and completed it. Motorists using another bridge in upper Lanang in Sibu town have to pay toll. This privatised bridged opened several months ago. On a related matter, Wong said the upgrading of the road between the Sibu airport and Julau into a dual carriageway was progressing well. The nearly RM200mil project is scheduled for completion in late 2008. On the planned Sibu-Tanjung Manis coastal highway in the lower Rejang Basin, which would also involve the construction of several bridges, Wong said the project was moving ahead on time. He said these road projects and the completed Durin bridge would link up areas in central Sarawak, open up more land for development and generate other economic activities. He said Tanjung Manis is home to the countrys largest integrated timber complex and will soon have a deep-sea fishing port with processing facilities.